If the most important invention of the 20th century is the electrical extension cord, the greatest aggravation is the appliance which refuses to work correctly. 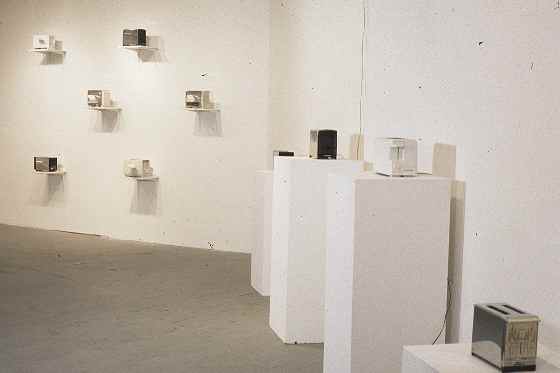 This exhibition is a part of a continuing investigation of the Machine Age. 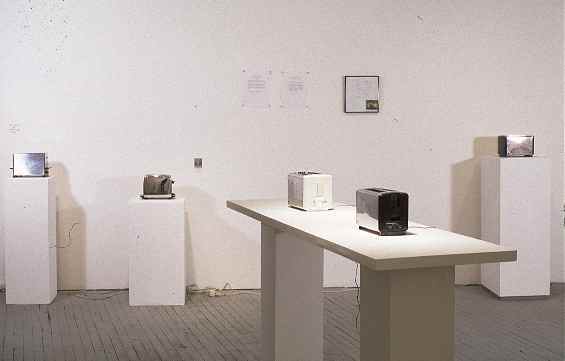 The exhibition includes 12 toasters which no longer work, because the machines have developed personality quirks which cause them to complain bitterly about making toast. Also a Mac Toaster, and a Flying Toaster Wall Saver. 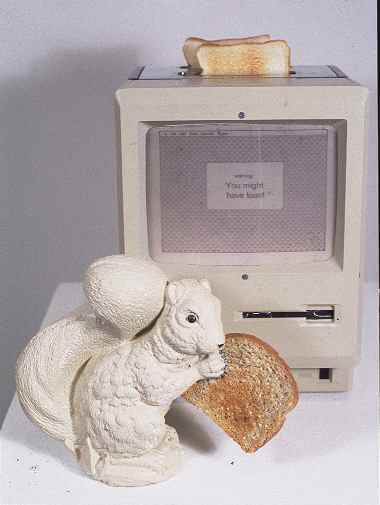 The scope was limited to toasters because "toaster" is also a simile among hackers for an appliance with an embedded chip which performs only a single task, and nothing else. Certainly this is our expectation in dealing with most people also. OK, that is the official story... Read the unofficial story as a metaphor for all the screwed up people we have to deal with in life. Dysfunctional Toasters follows from two earlier exhibitions, Dangerous Machinery, which included working machines dedicated to the purposes of critiquing aesthetics and art issues, and the exhibition NO CARRIER, which installed 16 operating computers eagerly debunking the hype of a digital revolution and the arcana of the Internet. All the toasters have secret identities corresponding to friends and acquaintances. The scripts and substantiation of voices are by Kirsten Daleske, the pyrotechnics are by Jno Cook. [Kirsten Daleske] studied zoology at the University of Illinois, and is currently Office Manager of Counterpoint Networking Inc. Although her first love is animals, she is an astute observer of humans. 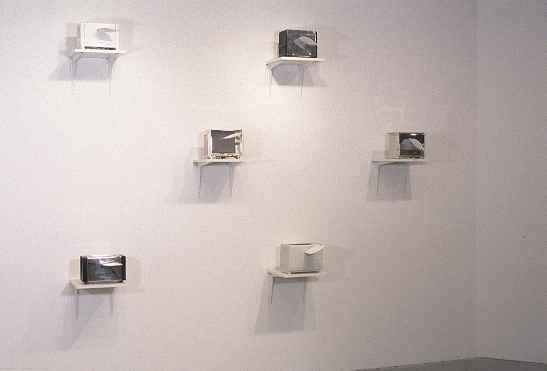 This, with her imagination and mimetic sense of humor, made her a perfect collaborator for this exhibition. 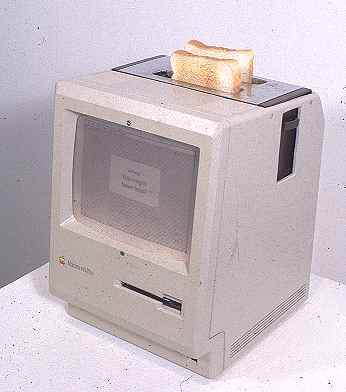 a classic MAC Toaster which makes toast, and announces each piece of toasted bread with, "Ding, You've got toast." For the opening we will use it to make toast. 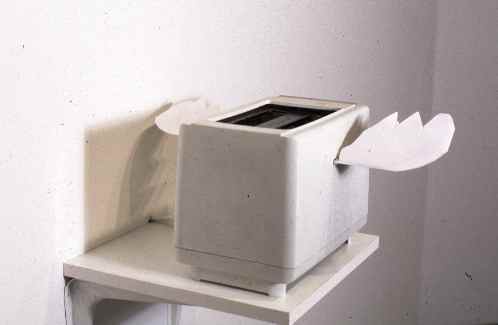 A "Flying Toaster Wall Saver" (suggested by Erik Pennebakker), which resounds another chord, the insult which escaped most users of Microsoft Windows, where the AfterDark screensaver was first used. What the toasters are saying.. Scripts and voices by Kirsten Daleske, except Taurus. The dialogs are recorded to 20 second microchips, which are supposed to last 10 years without power. There is a 1/2 inch master tape as backup, and a cassette tape of all the dialogs (slightly longer than what was actually recorded) is available. A [review] by G. Jurek Polanski which appeared in the on-line magazine [ArtScope]. The toaster [definition] from the OnLine Jargon File. If [so and so] made toasters. IBM, Mac (they do), Microsoft, others. I've seen various forms of this on the Internet, often with an expanded description for some corporation. This one filtered through employees of Anderson Consulting. And [here] is the price list. Pictures taken during the [opening] by Gabriella Scalpone, and Leah Abrahams. Feel free to send [comments] via email.